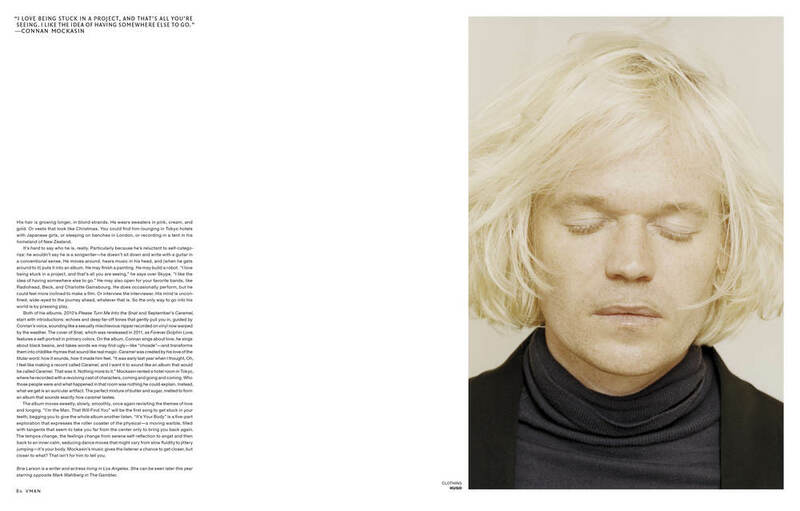 For the Spring/Summer 2014 issue of VMAN, had actress/writer/musician Brie Larson—who I knew, like me, was a longtime Connan Mockasin fan—interview and write about him. His hair is growing longer, in blond strands. He wears sweaters in pink, cream, and gold. Or vests that look like Christmas. You could find him lounging in Tokyo hotels with Japanese girls, or sleeping on benches in London, or recording in a tent in his home- land of New Zealand. It’s hard to say who he is, really. Particularly because he’s reluctant to self-catego- rize: he wouldn’t say he is a songwriter—he doesn’t sit down and write with a guitar in a conventional sense. He moves around, hears music in his head, and (when he gets around to it) puts it into an album. He may finish a painting. He may build a robot. “I love being stuck in a project, and that’s all you are seeing,” he says over Skype. “I like the idea of having somewhere else to go.” He may also open for your favorite bands, like Radiohead, Beck, and Charlotte Gainsbourg. He does occasionally perform, but he could feel more inclined to make a film. Or interview the interviewer. His mind is uncon- fined, wide-eyed to the journey ahead, whatever that is. So the only way to go into his world is by pressing play. Both of his albums, 2010’s Please Turn Me Into the Snat and September’s Caramel, start with introductions: echoes and deep far-off tones that gently pull you in, guided by Connan’s voice, sounding like a sexually mischievous nipper recorded on vinyl now warped by the weather. The cover of Snat, which was rereleased in 2011, as Forever Dolphin Love, features a self-portrait in primary colors. On the album, Connan sings about love, he sings about black beans, and takes words we may find ugly—like “cho- ade”—and transforms them into childlike rhymes that sound like real magic. Caramel was created by his love of the titular word: how it sounds, how it made him feel. “It was early last year when I thought, Oh, I feel like making a record called Caramel, and I want it to sound like an album that would be called Caramel. That was it. Nothing more to it.” Mockasin rented a hotel room in Tokyo, where he recorded with a revolving cast of characters, coming and going and coming. Who those people were and what hap- pened in that room was nothing he could explain. Instead, what we get is an auricular artifact. The perfect mixture of butter and sugar, melted to form an album that sounds exactly how caramel tastes. The album moves sweetly, slowly, smoothly, once again revisiting the themes of love and longing. “I’m the Man, That Will Find You” will be the first song to get stuck in your teeth, begging you to give the whole album another listen. “It’s Your Body” is a five-part exploration that expresses the roller coaster of the physical—a moving warble, filled with tangents that seem to take you far from the center only to bring you back again. The tempos change, the feelings change from serene self-reflection to angst and then back to an inner calm, seducing dance moves that might vary from slow fluidity to jittery jumping—it’s your body. Mockasin’s music gives the listener a chance to get closer, but closer to what? That isn’t for him to tell you.